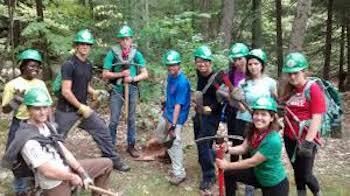 Service learning is an educational method, developed in the United States in the early 1990’s, that integrates service projects with classroom learning. In the process of guiding students to identify and solve real problems in their communities (and farther afield), service learning teaches academic and life skills. Bygiving kids opportunities to reflect on and learn from experiences of service and active citizenship, service learning helps them build lives as courageous and compassionate citizens. ~ Organized service that is conducted in and meets the needs of a community. ~The service is done in connection with an elementary school, a secondary school, institutions of higher education, or community service programs and with the community. ~ The service helps foster civic responsibility. ~ Time is set aside for students to reflect on the service as they go along. Over the past two and a half decades, teachers, administrators, and parents have come to understand that when service is linked to learning and placed at the core of the curriculum, the combination opens the door to the multi-faceted education all teachers want for young people, equipping them for their roles not just as learners, but as community members and workers too. And because service learning makes a positive contribution to communities as well, it has become an increasingly popular with community leaders and parents. Former California State Superintendent of Public Instruction Jack O’Connell put it this way: "Service learning makes academic content come alive as students apply their knowledge and skills to real-life situations. Students become more engaged in their studies and see that they can make a difference. Taking an active role in addressing community needs fosters responsible citizenship and contributes to character development." •builds character. Good character is very hard to teach as a theory. As we all know, character lessons are more likely to stick in us if we go beyond concepts and actually put those lessons to work in our own lives. That’s how we, and kids, learn that values actually work in the world. For example, learning to care about something beyond self is important. But what drives that lesson home is putting that caring into action by actually carrying out a project that helps other people. •fosters active citizenship and the practice of democracy.Students learn the complexity of problems in their community and the political, social and economic factors behind them. When they design and implement a service project that meets needs they care about, students become stakeholders in the community; they learn to care about what happens there. Students learn to express their concerns, lobby for their ideas, vote on ideas and projects, and raise money and other resources. •provides opportunities to learn and practice academic skills in writing, speaking, social studies, visual arts, communication, teamwork, critical thinking, decision-making and—depending on the nature of the service project—mathematics, health, science and technology. •provides opportunities to learn and practice important life skills.As they take on service projects, kids learn to plan, contribute to a team effort, resolve conflicts, speak in public, make good decisions and take responsibility. • fosters students’ eagerness to learn.Students become so intent on succeeding with their service project that even those with a long record of academic failure find themselves acquiring and using academic skills—not as ends in themselves, but as the means for doing something they really want to do. Investigators have found that when rigorous study in academic disciplines is linked to serious work on real needs, students become eager to learn everything they need to do their project. • builds confidence.Seeing the positive difference their actions can make in their communities gives a huge boost to kids’ confidence, as they see how valuable their actions can be. 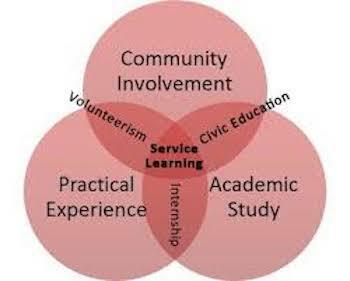 • Service learning must truly balance “service” with “learning.” The effort to link service learning with academic standards shouldn’t be allowed to overwhelm the premise that service, and the active citizenship it promotes, are important goals in their own right. 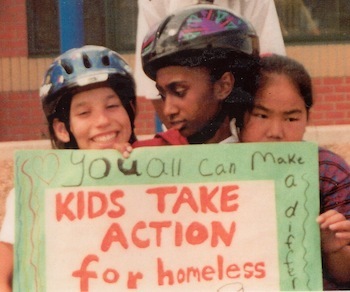 • Service learning programs should include effective “street smart” guidance for planning and carrying out projects—so that communities are in fact served and kids get the personal impact and satisfaction of visible success as involved citizens of their communities. • Service learning and character education should be linked. Service-action without moral reflection is of limited use. And moral reflection that is not deepened by action in the real world risks becoming only theory. Service learning should be student-centered, that is, it almost certainly means giving students more responsibility than you may be comfortable with.Your role is as a coach and not a decision-maker. Challenge the kids to find out what they care about, and to decide amongst themselves what problems they feel are most important to solve in their community. Their next task is to create a service project that helps solve that problem, using their talents, their experience, and their resources. Don’t dictate what that project should be, but support the kids as they plan and carry it out. As part of training kids to be good citizens, let them “rock a few boats.”If, in the course of an environmental lesson, for example, they discover that a local company is polluting the river, or that the town’s laws on pollution are lax, they may logically demand to challenge what they see as the first cause. Support them in doing that. This type of civic engagement is at the core of training them to be responsible citizens. Yes, they will make some mistakes—they’re young and inexperienced. Yes, you will want to check their letter to the CEO or the mayor and make sure the language is respectful and the grammar is OK, but don’t try to shut the students down or they will get exactly the wrong lesson—that they should never challenge authority, even if those authorities really need to make some changes. Giving students the major responsibility for choosing, creating, planning and carrying out their project makes them stakeholders in solving the problem. That means that they’ll put more energy and enthusiasm into the work, and that the lessons they learn and the sense of satisfaction they gain are greater than if they’re simply told to show up at the soup kitchen at 6:00. When kids work on a project that they choose, their experience is that much more impactful on their spirits, their self-esteem and their likelihood of continuing in a life of active service. Mandatory vs. voluntary service learning. It's always better if service learning is voluntary but sometimes it's mandated, by state or district requirements. This creates special problems because some kids will always resent being "forced" into a service project and may regard it as a punishment. If you're in this situation, be prepared to spend extra time discussing with your students why service is important, which problems in the school or community concern them most, and what projects they might most enjoy doing. Give them as free a hand as you can in designing and carrying out the project, with your role being mentor and coach. And don't pass up opportunities to help them connect with the positive feelings gained from helping others. a) When students reflect on what works and what doesn’t work in how they’ve tried to solve a problem, they can better decide how to improve their performance in the future. b) When students reflect on the causes of the problems they are helping solve, they become more aware of their complexity—and more savvy about solving them. They also learn in much more detail how their community really works. c) When students reflect on how they feelabout getting involved in service work, and about what they might be learning about themselves in the process—they gain lessons that will serve them—and their future families, communities and workplaces. Emphasize “community” in community service. When students design and implement a service project outside the class, especially one they’ve chosen themselves, they learn to care what’s happening in their larger community. They become part of the civic core who care about the common good. This is the essence of good citizenship. Start with the big kids. 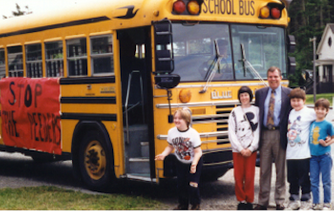 If you're introducing service learning in an entire school, start with the older grades. Younger kids will look up to what older kids are doing, but the reverse is not often true. Experience shows that there are two major institutional obstacles to implementing successful service learning programs. The challenge of change.Service-learning is not part of traditional pedagogies. Many educational leaders who recognize service learning’s value still have a hard time making it “fit” in their institutions. This challenge arises when any organization adopts what students of organizational behavior call a “disruptive innovation.” If a school chooses an innovative teaching method such as service learning, it will not take hold unless the school’s values and operating norms support the practice. The core challenge thus facing those who support service learning is to improve, spread, and sustain service learning practice. Strategic leadership and advocacy are essential. There is strength in numbers: service learning supporters need to organize behind a collective agenda for increasing the scope and quality of the practice. In schools where service learning flourishes, leaders create the right context for it by fostering the values of caring and contributing, pursuing public education’s civic purposes, supporting effective teaching, and seeking partnerships with community institutions. 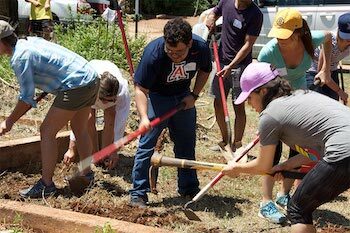 Where service learning has been given a chance to work, its distinctive effects on student learning confer advantages that few other pedagogies can match. Not enough time in the school day.Many schools and teacherssimply can’t find the time during an already overburdened school day to insert yet another innovation. The response to this challenge is to emphasize the “learning” part of “service learning” that is, that service learning, as noted above, provides opportunities to learn and practice academic skills in writing, speaking, social studies, visual arts, communication, teamwork, critical thinking, decision-making and—depending on the nature of the service project—mathematics, health, science and technology. Depending on the program design, for example, preparing for a project requires reading for comprehension and vocabulary, and learning to do effective research. Communicating to local leaders and citizens and fundraising builds competence in both writing and public speaking. Taking measurements and figuring out budgets involves mathematics. Learning about community problems and issues is social studies. You get the point. With a little reflection you should be able to come up with a convincing case that the skills-building that is an integral part of service learning belongs in any standard school pedagogy. It does not subtract from what student should be learning in the school day but adds to it. •provides opportunities to learn and practice important life skills.As they take on service projects, kids learn to plan, work in teams, fundraise, resolve conflicts, speak in public, make good decisions and take responsibility. • fosters students’ eagerness to learn. The Generator School Networkis an online community resource for fast and easy sharing, service learning professional development, and networking. 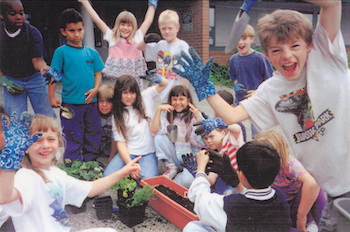 In this section, we share the stories of young people who have worked collaboratively to design and carry out service projects as part of service learning programs—applying the learning gained at school to real life projects that make things better in their schools and communities. We invite you to share your experiences as a way of inspiring and informing your colleagues. Send your reports to Projects@giraffe.org. Special needs School “Juana Manso”, Villa Allende, Córdoba province, Argentina. The effect of the Giraffe Heroes program on students can be profound. My name is Kathy Frazier and I’m an elementary/middle school gifted teacher in Kent, Ohio, USA. Let me tell you about just one of the many kids I’ve guided through the program. Secondary school No. 45 “Presidente Sarmiento”, Huillapima, Catamarca province, Argentina. .These fifth and sixth year students from the Agricultural Technical Provincial School No. 7 (named“Ing. Ricardo Jorge Hueda") in Perico, in the Province of Jujuy, Argentina, together with their chemistry teacher, started a project related to the problem of environmental pollution by carbon monoxide. “Protect me”—a project to increase awareness of the importance of mandatory annual vaccinations, launched in 2015 by students from Secondary School No. 75, Villa Pomán, Catamarca, Argentina. Kids today just watch television and make trouble, right? Wrong. Consider the swamp Kids, 12 sixth and seventh graders in Franklin County, Georgia, USA. “Swamp” stands for Solid Waste Management Plan, which is what these kids wrote and delivered to their county government! Implementation of their 756-page plan has extended the life of Franklin County’s dump by at least 20 years.